My first year of motherhood almost destroyed me. Actually, motherhood felt second nature. It was finding ways to balance my new identity with the other aspects of my life that left me feeling completely defeated. 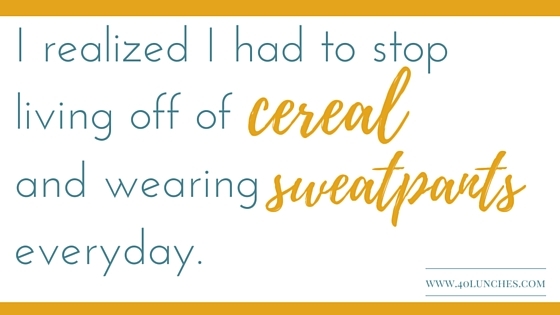 When my daughter was 15 months old, I realized that I had to stop living off of cereal and wearing sweatpants every day. I mean, I love cereal. And sweatpants. So I thought about my mothers Famous Last Words, and I created The Chat and Chew Supper Club. Each night twelve people were invited into a kitchen where I cooked supper (on an old Hobart that was installed in 1954) while performing an hour-long monologue. I wasn’t acting, just telling stories that were all tied together by a common theme. At the end we would all sit together at a long table and share a meal. The Chat and Chew Supper Club saved me. My marriage was in a dark place, I wasn’t socializing, I wasn’t cooking, and I wasn’t writing. The project brought my love of writing, cooking and fellowship together in one place. The best part about the project was that the twelve people who joined me for dinner didn’t always know one another. People brought wine. Stories were told. Some people even helped me wash dishes afterward. When I launched the project I decided to try crowdfunding. I wanted to bring in a director to help me shape the piece, and because I feel passionately that all artists should be compensated for their work, I wanted to pay her. But what I found was that crowdfunding served another purpose; it held me accountable. When people invested in the project – invested in me – I knew I had to follow through. The project was both empowering and terrifying. I’m not a performer. I enjoy feeding people, but I’m not necessarily a great cook (if that makes sense). Would people want to invest their time and money in a night with me? It felt like I was asking people out on a date, then telling them they had to pay. But every time I was overwhelmed by fear and self-doubt – every time I wanted to quit – I knew I couldn’t. People had invested in me. Eventually, the Supper Club came to an end. I cooked for over 250 people who I might not have otherwise had a chance to share a meal with. I performed the show on the stage of the Alabama Shakespeare Festival. I got letters from people who said they had never considered a meal a theatrical experience. It served its purpose: it reminded me that I was a writer, that food and fellowship have healing properties, and it gave me a sense of accomplishment. I am hoping the 40 Lunches Project will do the same. I look forward to paying back some of the meals I’ve been fed over the years when I was either a starving artist or a starving student. I am excited to connect with people I admire. And I appreciate the support of everyone who has invested in the project, because your contributions will hold me accountable. Thank you! You can contribute the the 40 Lunches project HERE. You will receive good karma, swag and my undying gratitude. THIS IS SO COOL. (Sorry for the yell.) I love your style, and I love that you did this. How amazing. Thanks so much, Lydia! I really do appreciate the support. I'm having a blast!